You must make reservations at least 5 minutes in advance of the time at The Cabin. Free valet for diners at the Cabin at the Grand Hotel. The free city bus and lodging shuttles stop at the Transit center, 1/2 block from The Cabin Restaurant. The Cabin features complimentary parking, weekly seafood specials, and happy hour at the Steamboat Grand Hotel. The vast menu spans fresh salads, entrees, sandwiches and burgers. Truly something for every taste. It’s a place that is all about fun, value, quality ingredients, served with a hearty helping of Steamboat’s warm hospitality and friendly service. Mother's Day Brunch. $49 Adults, $19 Kids 6-12, Free for kids 5 and under. Live music way too loud when we arrived. We were as far away as it was possible to get and still quite unpleasant! That alone will keep us from coming back! The food was ok but nothing special. Several restaurants in town have a much more diverse menu. Our server, Tinker was really the bright spot of the evening. The foods are okay with premium price. Not recommend to go unless you stay at the Grand hotel. Not a good experience. The service was not good and the food was mediocre. Too bad because it is a great location and nice decor. Really disappointing, very mediocre almost Applebee’s vibe. Spacing of courses could be improved. Salads and entrees arrive at same time. Middle of the road food. Very little ambiance. This place is an uninspired hotel restaurant. The food was bland and the service was poor (no one cleared a single dish the whole meal) and the cocktails were from a mix. Don’t go. Lovely spot and the service was wonderful! Great breakfast buffet for $18. Kids were cheaper, and under 5 free. There was no french toast or waffles. They didn't have chocolate chips to put on for the kids. They did have a good omelette station, pancakes, biscuits, bacon, and sausages. The service was great by waiters but the food was not good. Ravioli was served luke-warm and didn't have much flavor. It was too quiet in the restaurant. Some background music would be recommended. Food was very good, but service was just ok. We ordered 3 or 4 bottles of wine off the menu and they didn't have any availability. Seems they could be better prepared to service their customers based on the value and cost of the food and services. Ok we thought since at The Grand it would have the same excellent experience. Wrong..... pitifully slow service. Food good.... but not at the level we were expecting. Service was not at the caliber expected for a restaurant in The Grand. Easy drink orders were wrong & finished food sat on the table for a good 15 minutes after the last person had finished. The food was okay but would have enjoyed surprisingly delicious vs. okay. This was our Christmas night meal. They had a buffet, which we were aware and prepared to eat from but after we got our food, we learned from the table next to us that we could have ordered off the menu or at least looked at it. We would have preferred that opportunity and we didn’t think to ask, as our waiter only offered the buffet so we went that route. Husband and I each got a slice of prime rib which was tasty but we needed steak knives to properly cut. The sides like brussel sprouts, potatoes au gratin, etc were good but difficult to manage getting out of their containers, while attempting to keep the dish warm. Husband also got the salmon which he said was good and the desserts were nice. The total cost was $69 per person and with our cocktails (two each) our bill was around $220.00. We left fully stuffed but we weren’t impressed with the offerings or atmosphere. We’ve eaten there before but was reminded why we don’t make this a habit in our travels to Steamboat. There are better places in Steamboat to enjoy great food. Very limited and very basic breakfast menu and buffet. Several ingredients listed on the menu for my entree were missing from my plate. I’ve had better at Motel 6. Overpriced buffet... $317 for our family of 4 and we were seated in the bar. It was awful. Christmas Eve and we expected a little more for the price!! $75 per person and it was just...bad. Terrible ambience. It was so bad when we left the restaurant all we could do was laugh!! We booked expecting dinner to be as shown in the website but they had a buffet (rather expensive at $69 each) that night. Staff was very accommodating and allowed us to order from menu and out server was very friendly. Food was good. Vegetarian ravioli was quite tasty as were the beef dishes. Tuna poke salad was a disappointment. Crane brûlée was small and a bit sweet. Would like to try again on a night when regular menu is the menu. Breakfast buffet. Excited to see biscuits gravy and green chili. Runny gravy and tasteless chili. Juice was weak and iced tea horrible. No desserts. Service so so. Won’t be back. We did Thanksgiving buffet. It was EXCELLENT!!! Very traditional preparations. Great deserts! We'll probably be back for Christmas. Food was just average for such a great buildup by the advertising. The waitress we had wasn’t very nice. She kept complaining she was too busy and was very rushed to give us the check and have us pay. Very limited menu. Food was good, but no reason to run back. Very good breakfast. Good prices . The waiter was very friendly. Not far from the gondola. The food and the service were great. The only unfortunate thing is that there was only one more person in the restaurant. We almost left because no one was there, but we were glad we stayed because the food was delicious. Off season menu was VERY limited (not even close to the menu on the website). Myfood was good but I felt like the other people in my party had to order entrees that they were not too excited about. Our server was friendly and seemed experienced but not familiar with the (limited) menu and could not answer questions about peanut content in the carrot cake. had an excellent late breakfast here. 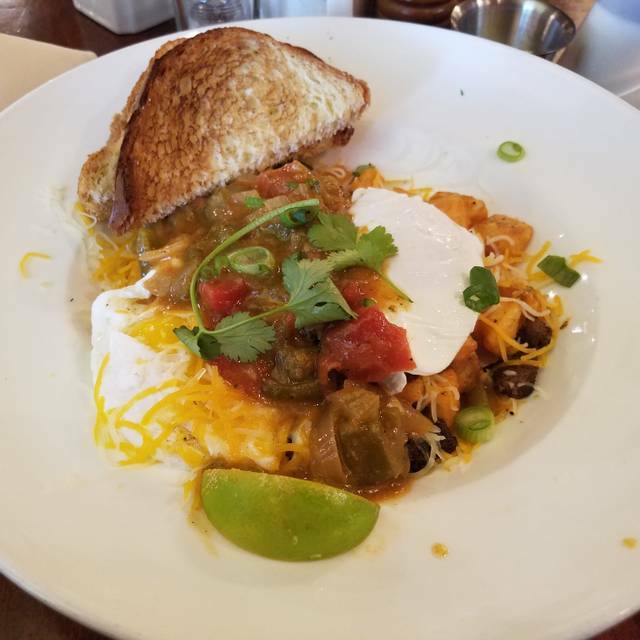 server Tammy recommended their chorizo skillet and she definitely didn't steer me wrong! We stopped in prior to a concert and were not disappointed. We were able to receive outstanding and fast service. I thought the hamburger and fries were exceptional. The wine values in happy hour were excellent. We had a great experience! Not your average hotel restaurant, much nicer and not overpriced. Love it! The kids enjoyed the lobster Mac n cheese. I had the goat cheese risotto balls with marinara sauce, Cesar salad. The food was great. Food was generally bad. Grilled cheese had to be sent back. Kitchen Managment is poor, food arrived all at once after 45 minute wait. Our server was the one bright spot in the experience. Colin did his best to compensate for a poorly managed restaurant. Surf and turf was delicious. Not a lot of cocktail options. Nice meal and good service, Dined 2 evenings both enjoyable. Need to actually put SOME LOBSTER in the LOBSTER MAC and Cheese, $28 for noodles and cheese (3 tiny pieces of lobster). Overall a nice place to dine!